The cottage industry spread across various sectors including handicrafts, handloom, textiles, coir, jute and food processing, commands enormous market potential in the current state. The total export value of textile, handicrafts, jute and coir products from India stood more than USD 26, 561 million during 2010-11 with a CAGR of around 10 % over the last 5 years. India is the 2nd largest textile economy by production in the world after China. The textile industry in the India is expected to grow at a CAGR of 20% during the next 5 years. The export of handicrafts alone is expected to reach USD 6,177 million by 2016-17. The Food Processing Industry is estimated to be worth around USD 67 billion and expected to increase to USD 175 billion by 2025 in the country. Ministry of Food Processing Industries (MoFPI) through its Vision 2015 envisages increasing the level of processing of perishables food products from 6% to 20%. Gujarat has remained one of the leading states in textile and handicrafts production with a huge scope for further expansion. Gujarat Technical Textiles market is estimated around Rs. 6,100 crore in 2011-12; contributing around 10% to the national technical textiles output. Handicrafts items such as jute crafts, toys from the Kuchchh region have good demand. The state is known for its world famous double ikatPatola from Patan. Home furnishing with speciality use of embroidery, zari work, etc is another potential area. Districts like Ahmedabad and Surat have good number of artisans making home furnishing items. The potential of food processing & food products segment can be gauged from the fact that Gujarat contributes 14 percent to 20 percent share in major fruit and vegetable crops of the country. GLPC is involved in promoting livelihood in the cottage industry sector by facilitating technical and financial assistance to the beneficiaries through various Central and State level schemes. During the year 2011-12, GLPC facilitated various projects benefitting more than 14, 300 SHG members across the state with major focus on areas like handicrafts, food processing and textiles. 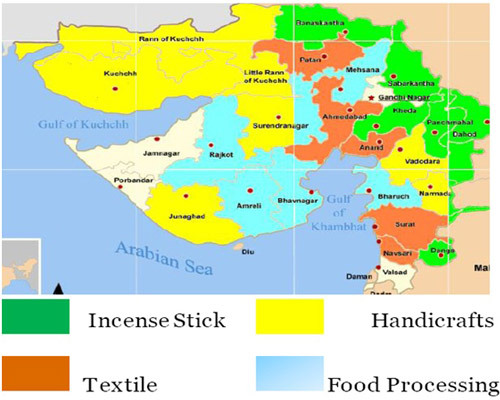 In 2012, GLPC facilitated the 'Mechanized Manufacturing of Incense Stick Project' by entering into a MoU with ARSI Industries and other private players targeting 1o,000 SHG members covering districts like Anand, Kheda, Narmada, Panchamhal, Sabarkantha and others. Technical support was provided by RSETI, NABARD, RTGI and financial support was facilitated through schemes like SGSY, VikashsheelTaluka Fund, Vajpayee Gram UdyogYozana, etc. The project exhibited a winning proposition for all the stakeholders with creating sustainable livelihood opportunities to more than 500 households so far with scale up.